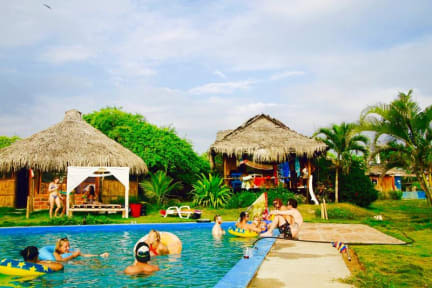 Kamala Surf & Backpacker Hostel, Montanita, Ekwador : Rezerwuj teraz! Wake up to the sound of waves and spend the day relaxing in a hammock with an icy cold beer watching our two pet donkeys play, having a fun game of volleyball or hanging out with a cocktail in the massive pool. Then head to the open plan, sea-view bar for live DJs, all major sports events and happy hour specials, with ping pong, pool, flip cup, dice games, shot challenges and beer pong! Kamala Surf & Backpacker Hostel offers free WiFi and free parking. The restaurant has delicious fresh juices & continental breakfasts with Poached Eggs and Smashed Avo, Bacon & Egg Breakfast Burger, Breakfast Burrito and more! All our bread is homemade, lunches are Pulled Pork Sandwiches, Chicken Wings, Falafel Wrap, Pizza and many more. There are plenty of treats on offer such as Chocolate Brownies and Baked Oreo Cheesecake. Daily communal dinners range from Homemade Gnocchi, Lasagna or Thai Peanut Curry to Chicken Parmigiana and all your home favourites! We also have an outdoor BBQ and clay pizza oven. We have a variety of surfboards for rent, from short fun-boards to longer learning boards to check out Montanita's world-class waves, or if you fancy something a bit more relaxed, why not have a massage in our open-air studio. We can also help organise scuba-diving, parapenting, waterfall treks and much more! Kamala Surf & Backpacker Hostel is a beachfront paradise located just south of Montanita town center, either a 20 minute walk along the beach or a $1.50 taxi ride from town (everyone knows where to find us!). Close enough to be easily accessible but just far enough to escape the constant noise and madness of Montanita town! Kamala offers a choice between deluxe cabins with your own private balcony and shared dorms, all at an affordable price and, all offering hot water (except the basic 6 bed dorm), fan and WiFi. Check out before 11:00. Late checkouts available at extra cost. Valid PASSPORT (no ID card/cedula) necessary for Check-In. Reception available from 07:30 to 23:00. Late check in available if arranged in advance.